Ian's close-season blog post, below, assessing our prospects of "staying up" in the top flight, now looks strangely pessimistic, in spite of his conclusion that he's "confident we can survive". What a difference the confidence of our team has wrought. With a quarter of the season gone, Accies have been in unexpected breathtaking form, and we stand clear top of the league on merit. Top scorers, best defensive record, unbeaten since the first game, headline-grabbers as the first away league winners at Celtic Park for nearly two years... the list of our accomplishments goes on. And special mention to Ally Crawford, hitherto a target for frequent abuse from many of our fans, and now the SPL's top goalscorer. Crawford currently looks like one of the most threatening midfielders in the SPL. The problem with all of this is that it invites predators, and there is already much speculation that we could lose the likes of Crawford, Andreu and Gordon in the January transfer window. 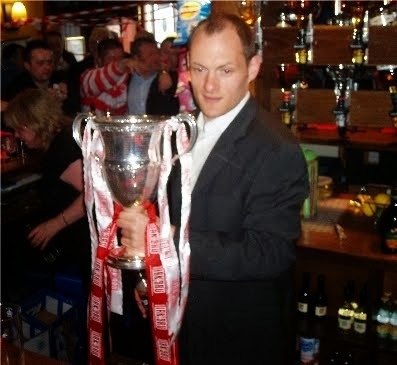 Not to mention the architect of this success, "Sir" Alex Neil. Despite his total managerial experience amounting to less than one-and-a-half seasons, Alex has made a huge difference to the way we play football and the results we've achieved. Building on the good work of Billy Reid, Accies' most successful post-war manager, Alex has accelerated the promotion of young players, trained them to retain possession, developed a free-flowing passing style, and instilled a fearless, winning mentality. For me, he has been the stand-out Accies player of the last decade, but he's already eclipsed his on-field exploits in his short spell in the dugout. It's now surely just a matter of time before he surpasses the peak of Billy Reid's reign, 7th in the SPL, and leads us to a top six finish. Well done to everyone at the club for making this one of the most pleasurable times to watch Accies. On a personal note, this has been my first blog post for a while, and it may be some time before I post another. The reinvention of the Acciesworld forum has made it, for now at least, a more civilised place to visit, and I look forward to spending more time there. A downturn in our fortunes could change that, but it's hard to see any such downturn looming. I still believe there is room for a multi-user blog as well as a discussion forum, and I hope others will take up the open invitation to post here. What are the odds of Accies staying up? As the new season approaches what are the odds of Accies staying up? Arguably the squad that has won promotion via the play offs does not have the same depth as the one that won us outright promotion in 2007. Then the presence of the '3 Diamonds', Alex Neil fit and at his peak alongside experienced players like Canning and Mensing, saw Accies hit the track running so to speak with opening victories against Dundee United and Inverness. On the face of it then you might expect Accies to be the bookies favourites to be relegated and you would be right with Coral offering odds of 12/5, Ladbrokes 11/5 and others 5/2. But the big difference since 2007 is the seismic change in the membership of the Premier League as the financial meltdown has taken its toll. No Rangers, no Hearts, and although not due to financial overspending, no Hibernian either. Aside from Celtic, the only Premiership clubs with comparatively big player budgets are Dundee United and Aberdeen and even they have to balance budgets against debt. Other clubs might not have the budgets but both Motherwell and Saint Johnstone have developed squads that look as though there is still more to come in the new season. That leaves Accies playing in a league that has this time round has a more level playing field in terms of resources. In effect we are in a league of seven including ourselves, and an Accies side judiciously strengthened and injury free should be capable of taking points from any of the others. Nor should we discount taking points of the likes of Aberdeen or Dundee United. Inverness took their time last season to get used to the managerial change from Butcher to Hughes and they seem to have lost some of their sparkle but with Butcher’s departure from Hibs, an anticipated raid during the close season on their squad hasn’t materialised. Kilmarnock appear to have sorted out their financial problems but their management team of Alan Johnston and Sandy Clark came in for a lot of criticism from their fans and it was interesting to see Clark depart to be replaced by Gary Locke. Despite an apparently strong contract offer, losing Kris Boyd who scored 22 goals for them to Rangers will have an impact. Can’t see his replacements Lee Miller and Josh Macgennis equalling that total. Interestingly Johnston is the bookies favourite to be the first to lose his job this season. Saint Mirren’s board clearly felt that the squad they had was underachieving under Danny Lennon but the appointment of Tommy Craig caught many by surprise. Championship winners' Dundee have had a big clear out of players as Paul Hartley has sought to reshape the squad that he had inherited from John Brown. Sometimes too many as much as too few changes can be dangerous and it will be interesting to see how Hartley moulds his squad with 11 new faces. Partick Thistle under Alan Archibald’s guidance survived their first season back in the top flight aided by the mid season loan signing of Lyle Taylor. Taylor has since been released by Sheffield United and Partick were looking for him to sign full time but he has gone to Scunthorpe. And then there is Ross County. A bad start to the season saw manager Derek Adams strengthening the team quite radically mid term backed by Roy McGregor's money, but they will not want a repeat this season and to date have made 8 summer signings. So all to play for in my opinion. 11th place, as we are well aware, will no longer guarantee safety but league reconstruction means that any team getting relegated via the play offs will receive a parachute payment of £500,000 in their first season down and £250,000 in year two assuming they stay down. A significant financial cushion that should allow teams to weather the drop. Back to the odds. Currently you can get odds on Accies to win the Premier League of between 300 and 750 to 1 but we are the bookies' favourite for outright relegation with Partick Thistle closely behind. While the odds will change I’m still confident we can survive. And so Accies discover a new, more exciting way to win promotion. Nobody can deny the events of Easter Road were hugely exciting and entertaining, and as exhilarating for Accies as they were devastating for Hibs. Nobody, even most of our own fans, expected us to do it. The first leg had been a big disappointment - somebody summed up that game as "Accies played the football, but Hibs scored the goals", and the least that can be said is that we dominated the first half. But the bottom line is we lost 0-2 at home, and only the biggest optimists felt we could overturn that deficit in the away leg. The script required a more urgent Accies than in the first game, with greater penetration: Jason Scotland, in particular, duly obliged. It required Accies to score the first goal, preferably early on, and in 12 minutes, Jason Scotland obliged again. It required an equaliser in 90 minutes, and with 1 minute 20 seconds to spare, a sublime combination featuring Gordon, MacKinnon, Scotland and Andreu led to the last named blasting into the net. That took us into extra time. 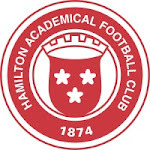 Accies dominated from start to finish, played the best football, had a clear goal scoring chance denied when referee Collum missed a blatant cynical foul in the second half, and could well have won by more in normal time. If we had, Hibs could have had no complaints, and it might have saved them later agony. After a great game, extra time was an anticlimax, with both teams exhausted, and so the penalty shootout arose. I don't know who would have taken the fifth Accies penalty - I've read Alex Neil, I've read Jesus Garcia Tena - but it wasn't needed, because Gillespie, Andreu, Antoine-Curier and Scotland all coolly scored, while Cuthbert saved two out of five Hibs pens. The media have focused on Hibs' dramatic fall, and the fall-out, but these are trivial concerns to this blog. This was all about Accies' triumph, and manager Alex Neil winning promotion in his first full season in charge. It was about a special blend of youth, such as Gillespie, Gordon, Crawford and Longridge, with experience in the shape of the likes of Cuthbert, Canning, Neil and Scotland, gelling into a successful team unit. And it was about an unforeseen conclusion to a rollercoaster season. In time, we'll move on to speculate about our prospects in the top flight, back where we spent three seasons just two years ago. We'll look ahead with relish to contests with the best teams in the country. But that's for another day: the here and now is about celebrating one of the greatest victories in Accies' post-war history, and dreaming of what it may portend. Thanks and congratulations are due to everyone associated with this phenomenal success. Hibs 0 Accies 2, aggregate 2-2, Accies win 4-3 on penalties, Hibs are relegated to the Championship, Accies are promoted to the Premiership. Yesterday's win deserves celebration regardless of its context. Ten goals is the most I have ever seen Accies score in any game - I suspect it's the most any living Accies fan has seen us score. 10-2 is the biggest winning margin I have ever seen Accies record. Others will have seen 8-goal wins before, with our 9-1 wins over Berwick in 80/81 and Brechin in 93/94, but I missed both of those. Twelve goals is the biggest single game total I have ever seen Accies involved in - my previous highest, with much less cause for celebration, was 3-8 to Celtic in 86/87. It was a tumultuous end to the season, albeit somewhat subdued by the circumstances of losing the title to Dundee by virtue of their last game home win. The game invites comparison with our narrow miss of promotion in the memorable 91/92 season, when we lost out on goal difference to Partick Thistle on the last day. Similar conspiracy theories have emerged about missed chances for Partick's and Dundee's opponents respectively. These should be discounted as readily as competing theories that Morton players took a trip to the bookies before yesterday. The big difference is that we always trailed Partick in 1992, and only drew level on points due to their last game draw. Finishing second this season is a great accomplishment, not least because for the first time in many years it affords an opportunity for promotion, via play-offs. Hopefully the disappointment of having thrown away automatic promotion in the crazy last quarter of an hour at Dumbarton last Saturday will be eclipsed by yesterday's fantastic performance and result. The play-offs beckon: let's see if we can do it.